I went out to Vermont for a little Lyons family reunion. The Ireland contingent was there which was a special treat. We had nice weather and lots of great meals. It was a pretty chill schedule. I did a small hike with Deed and Dad and we poked around the Bookstock festival in town and played some mini golf. 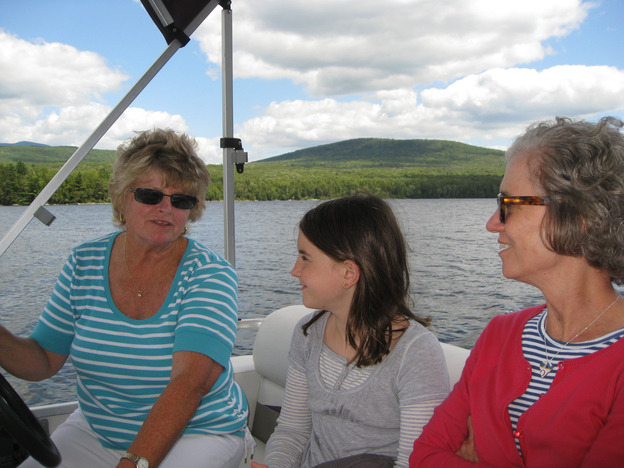 We also drove into New Hampshire for a reunion of my father's cousins at Joyce and George's great lake house. My 92-year-old Great Uncle Chick was there and it's always fun to see him. Matt and I did some kayaking around the lake and Joyce took folks out on her pontoon boat. Sadly the second group got stuck with engine trouble in the pontoon boat and had to be towed back to the dock. After they were gone far too long, Joan went out in a kayak in search of them. Joyce also took us out to the barn to see her two horses Spirit and Bo, and Caoimhe road a horse for the first time ever. The travel back was a bit of a pain. I took a small 10-seater Cessna from Lebanon, New Hampshire to Boston, but then US Airways cancelled my Boston to Washington leg. I got rerouted on an AirTrain flight to Denver but it didn't leave until about six hours later. So door to door it took me 16 hours to get home. Thankfully Google provides free wifi in Boston Logan so I was able to get some work done on a side project while I was there. This week is the 2-night Boulder Denver New Technology meetup where the TechStars 2010 startups present their pitches. I only got to see the first two last night. I had to cut out early to walk over to Chautauqua to hear Zoe Keating perform. Tonight the rest of the companies present. It's a big and enthusiastic crowd. We completely filled the large lecture hall and had to spill over into another classroom upstairs with a live video feed. Also this week is TEDx Boulder, which I'm looking forward to.